Welcome to our new weekly round-up of five must-not-miss events and happenings in Belfast’s Cathedral Quarter! To see even more, visit our full event listings in our What’s On section. It’s the last week of the Out To Lunch Festival, and they are not making it easy to say goodbye, with the final week absolutely rammed with incredible talent and once-in-a-lifetime shows. Catherine Bohart plays the Black Box in Tuesday and Niamh McGlinchey graces the same venue the next day. 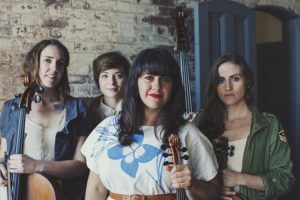 On Thursday, The Friel Sisters are in The Black Box in the afternoon; Yorkston Thorne Khan hit the Black Box that evening, while Grainne Holland launches her new album Corcra in Rosemary Street Presbyterian Church. On Friday, Martin Harley‘s in The Sunflower and Teddy Thompson is in The Black Box; Saturday sees Laura Cortese and the Dance Cards in The Black Box, with The Delines taking the stage that night. Finally, we round off with The Once and Mull Historial Society in The Black Box on Sunday. 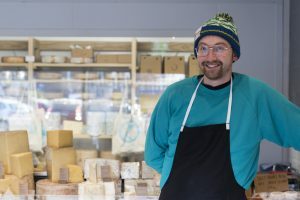 With the festive cheer of Christmas a distant memory and the coffers decidedly echoey, Mike’s Fancy Cheese is riding to the rescue with some cheesey beer-soaked balm for your soul. They will have four different blue cheeses, paired with delicious Boundary Brewing beers and a little bit of ‘blue’ music to match the general vibe of the day. In recognition of the long month that it is, this is a ‘pay what you feel’ event – pop into the shop to put your name down, then pay what you think it was worth on the night. NIWM commemorates Holocaust Memorial Day every year. This year the museum marks the day with an exhibition of paintings by local artist Leslie Nicholl. 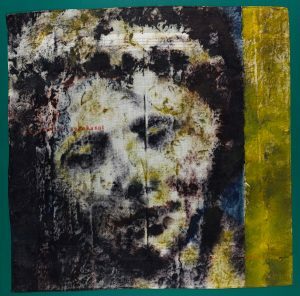 The series, My Name Is Might Have Been, was inspired by the story of Helen Lewis, a Holocaust survivor who settled in Belfast. The artist, inspired by Helen’s book A Time To Speak, retraced her journey from Terezin concentration camp on the outskirts of Prague to Auschwitz in Poland during a bitterly cold January and February. Haunted by what he had seen, Leslie painted faces onto handkerchiefs. The exhibition will open to the public on Wednesday 23rd January at 7.00pm when Leslie Nicholl will provide an artist’s talk about the paintings and why he was inspired to make them. This will be complemented by readings from Helen Lewis’s book A Time To Speak by international recitalist Frances Mulley who knew Helen personally. Places are limited so if you wish to attend, please RSVP by emailing info@niwarmemorial.org. The exhibition will be on display from 23rd January – 29th March. On Thursday, photographic gallery Belfast Exposed has two exhibition previews – one of an exciting new group exhibition with photographic works selected from Arts Council Northern Ireland Collection, curated by Deirdre Robb and Mirjami Schuppert, and a solo exhibition of Belfast Exposed Futures Artist Linda Conroy, Breaking the Mould. The works in the Arts Council exhibition have been chosen carefully to try and reflect the breadth, diversity and talent within Northern Ireland photography – locally, nationally and internationally. Conroy has taken the Church and identity as a source of inspiration for Breaking The Mould. Throughout the exhibition, everything you see is slightly disrupted or interrupted in some way, with recognisable images of Church remaining the only constant throughout. If you’re familiar with the airspeed of an unladen swallow, have ever used “the smell of elderberries” as an insult, or know full well that Brian of Nazareth is not the messiah, he’s a very naughty boy, then this Sunday you really should make your way to The Sunflower Bar. 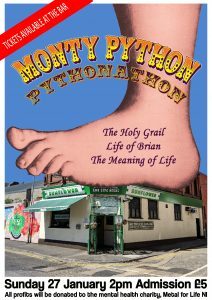 Starting at 2pm, they’ll be showing three Python films back to back – The Holy Grail, The Life of Brian, and The Meaning Of Life. Tickets are available from the bar, all proceeds go to mental health charity Metal for Life NI, there will be a silly walks competition and dressing up is not just permitted, it’s positively encouraged.